MILWAUKEE (AP) After being torched for 65 points in the first half, the Milwaukee Bucks turned up the defensive pressure against the Memphis Grizzlies. The Bucks got off to a strong start, shooting 65 percent from the field in the first quarter, including 6 for 6 on 3-pointers, to take a 34-29 lead. ”It was confidence boost to see shots go down,” Middleton said. Fizdale said he is taking a positive approach with point guard Mike Conley, who has struggled with his shooting this season. He made 2 of 12 shots against the Bucks after entering the game shooting 40 percent from the field and 31 percent from 3-point range. Bucks: Middleton, who entered the game shooting 26 percent from 3-point range, hit his first three attempts from beyond the arc. … Bledsoe started but was a game-time decision with a knee contusion. ”He got hit. 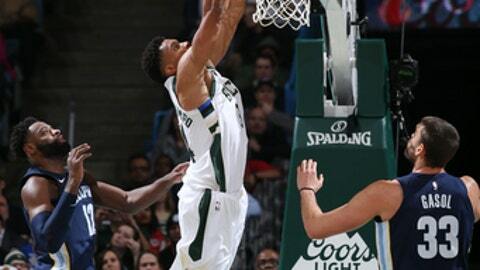 It was sore,” Bucks coach Jason Kidd said. ”He was good yesterday. This morning he woke up and it was a little sore.” … F Mirza Teletovic missed his third straight game with left knee soreness.